Last summer, Villiger Cigars introduced the Flor de Ynclan line. Actually, it was more of a re-introduction. Villiger originally debuted the line, which takes its name from an old Cuban brand, back in 2007. Eleven years ago, a “small batch” of La Flor de Ynclan was crafted by Villiger with unsatisfactory results, leading to a decision to cease production. The 2017 re-introduction, therefore, wasn’t merely a second go-around with the same recipe. It had been re-blended by José Matias Maragoto—overseer of all Villiger-made product in the Dominican Republic—to feature an Ecuadorian wrapper, Indonesian binder, and Nicaraguan and Dominican filler tobaccos. La Flor de Ynclan is handmade at the ABAM Cigar Factory in the Dominican Republic. It has three regular-production formats: Robusto (5 x 50, $11), Torpedo (5 x 52, $12), and Churchill (7 x 48, $12). In addition, this year a limited edition Lancero Especial (6.75 x 43, $11) was added; only 500 boxes of 25 will be made annually. 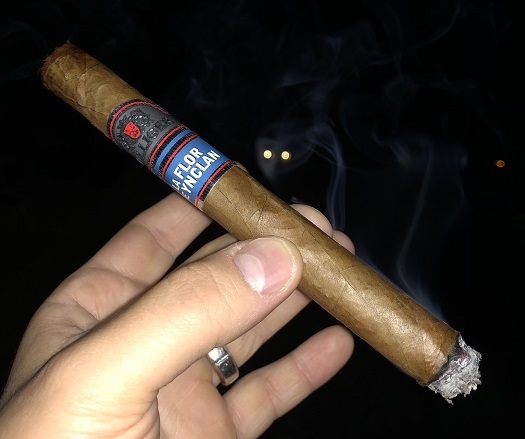 This vitola has a pigtail cap and, like its 2017 predecessors, sports a metallic band of silver, blue, red, and black (in case you’re wondering, the 2007 La Flor de Ynclan band depicts an enrobed woman posing with two spears and one hand atop a globe). In terms of flavor, the Lancero Especial can be thought of as a more concentrated, slightly stronger version of the Toro I reviewed over a year ago. The core profile of oak, cream, and cinnamon is very similar, though the body is decidedly medium instead of mild- to medium-bodied. In the background, attentive smokers will notice hints of citrus, vanilla, and almond. The texture is bready. The cinnamon spice becomes more prevalent toward the midway point. Here, I also find a taste of white pepper. In the final third, there is a shift back to oak and citrus, and the spice is more reminiscent of black pepper. Across both samples I smoked for this review, the physical properties left little to be desired. Despite being spongy to the touch, the Lancero Especial exhibits a near-perfect burn behind a sturdy ash. The draw has some resistance but is mostly clear. The smoke production is average. All told, I give the slight edge to the Lancero Especial over the Churchill—but not enough of an edge to change the overall score. I’m sticking with my (very admirable) rating of four stogies out of five.